A couple of weeks ago, I received a package from a good friend and colleague. 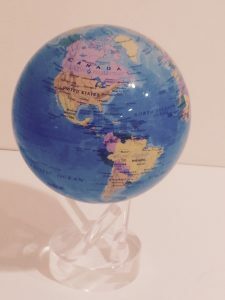 With great curiosity, I carefully opened the box to find a beautiful small globe and a smartly designed clear acrylic table stand. Placing the globe on the stand, the globe appeared to be floating in the air. As if that wasn’t magical enough, when I placed the globe in the natural light of the sun, it started turning, just as the earth rotates on its axes. Even when holding it in my hand, the globe continued to turn. I was mesmerized. I knew immediately where I wanted my new treasure to live. I set it up on my desk just to the left of my computer screen so that I would see it all the time as I was working. Ever since, this spinning Earth has been “talking” to me. While there have been many insights and reminders, three simple truths keep coming up day after day – reassuring truths that bring me back to center, no matter what is going on, and remind me of a greater reality that exists in the interconnectedness of all. No matter what happens, the sun will set, and this day will come to an end. And tomorrow morning, the sun will rise again, and it will be a new day. Everything is moving, shifting, and evolving all the time. This includes me, and everything that is happening around me. Nothing is ever truly standing still. There are billions of people all over the world, and every single one of them – famous or unknown, rich or poor, successful or floundering – is on their own learning journey. And so am I. 1) No matter what happens, the sun will set, and this day will come to an end. And tomorrow morning, the sun will rise again, and it will be a new day. Whether it has been a fantastic day or a really difficult one, tomorrow morning I can begin again with a fresh start. I can choose anew where I put my focus and how I engage with the people and circumstances around me. And everyone else will have that opportunity as well. Recognizing endings and beginnings helps us to acknowledge where we have been and what has happened. At the same time, it gives us a structure through which to focus our thoughts and intentions for moving forward. Even when our circumstances or situations stretch out over many days, weeks, or even years, there are still cycles or chapters within the larger flow. There are moments when we can pause, recalibrate, and realign. The rhythms of the Earth provide these natural pauses, periods of rest, and fresh starts. 2) Everything is moving, shifting, and evolving all the time. This includes me, and everything that is happening around me. Nothing is ever truly standing still. In fact, we are constantly moving forward in time, whether or not we acknowledge it. In this physical world, time only goes forward. Whether or not we want to move forward, or think we are ready to move on from chapter of our lives, life around us goes on anyway. The Earth never stops rotating and spinning through space. Time keeps marching on. When I find myself struggling, it is usually because I’m trying to hold onto something from the past – a belief, a relationship, a way of doing things, a hope or dream that is no longer serving me – or I’m attached to a particular outcome. Life is movement and flow. When I choose to dance with it and find my place within the flow rather than try to hold onto a belief, a practice, or a way of being that belongs to another time, everything is easier. 3) There are billions of people all over the world, and every single one of them – famous or unknown, rich or poor, successful or floundering – is on their own learning journey. And so am I. Everyone has people that they love and things that they hold dear. Every person has experienced heartbreak and desires happiness. Every person has experienced fear, doubt, and struggle, yet hopefully has also known courage, confidence, and flow. Although we all have these basic things in common, there are also many ways in which our fundamental worldviews and beliefs, our ways of life, and our personal experiences are very different. We will never all agree on everything. We will not all like each other. However, we do share a home called Planet Earth. Therefore, it will help if we respect one another’s basic humanity and recognize that underneath our differences lie some basic and important similarities. For me, this fundamental respect feels like a more reachable ideal than “world peace.” So I hold the vision of people from all over the world – people with different beliefs and different ways of life – pausing to look one another in the eye and shake hands. That’s all. No words, no agenda. Pausing just long enough for their hearts to recognize each other. Just long enough to acknowledge that we are all here having this human experience at the same time. As I write, the beautiful globe on my desk continues to turn. It reminds me that I am just one person among billions on the Earth, yet that how I choose to live my life every day matters. It reminds me that every day I have the chance to start anew, and so does everyone else. It reminds me to dance in the movement and flow of life, to learn forward, and to pause throughout the day to remember that everything and everyone is connected. P.S. If you are looking for a short exercise that can help you come back to your center, no matter what is going on around you, take a few minutes to experience the Point of Stillness Meditation that is available for free in the Resources/Audio Media section of our website. It’s one of the most popular exercises among participants in our workshops.